by John R. Beaman, Jr.
As author of "Last of the Eagles" and the Squadron Bf 109 "In Action" books John Beaman is a pioneer of identifying the specific variants and camouflage schemes of German World War Two fighters. John has also been a generous participant in HyperScale - offering comments, opinions and assistance both in the preparation of Reference Features and on the "Plane Talking" Discussion Group. I am therefore very pleased to present John's new article describing the sometimes subtle differences between the various sub-types of the Focke-Wulf Fw 190 A, F and G models. 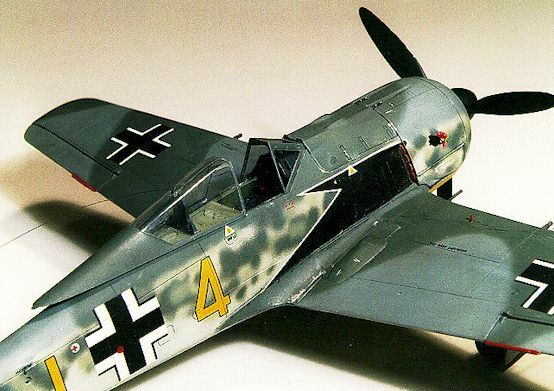 I have noticed many questions on HyperScale's discussion board that relate to converting one model of the Focke-Wulf Fw 190 to another. I thought it might be useful to give a brief outline of Fw 190 variants and their evolution. For those who are serious about modeling the Fw 190, good references are essential. If you are willing to pay $30+ dollars for a kit, why not also spend that much on a reference or two that will carry you thorough many Fw models? The single best explanation of Fw 190 variants is Model Art Special #216 which covers the A, F and G. This book contains great drawings and details both straight out of manuals, and redrawn from manuals. Although most of the text is Japanese, the flow is easy to follow. This wise investment is available from many sources for about US$30. The second best investment is Peter Rodieke's new book published by Struv Druck. It is about twice the price of the previously mentioned book and does not have as many detailed variant drawings, although it does cover the D and Ta 152. The photos, however, are priceless - many have never been published anywhere else. I would highly recommend both books. Look at this way - for US$90-100 you'll have everything you would ever want to know about the Fw 190 at your fingertips. The following covers only the single-seater variants powered by the BMW 801 family of engines. The Fw 190A falls into two broad categories: the A-0 through A-4 and the A-5 through A-9. The F and G variants also roughly follow this breakdown. The most significant structural difference is that the fuselage of the A-0 through A-4 was shorter than the A-5 through A-9. Front cowling armor ring is different. The 4 wing guns are all MG 17s, as were the cowling guns. Some were later fitted with the MG/FF 20mm cannon in the outboard position. The bulge on the side of the engine cowling that covers the interior air intake is shaped like a perfect teardrop. This first production variant went into service in July 1941 with 6./JG 26, then to other parts of II Gruppe, then into limited service with JG 2 and JG 1 about 6-9 months later. The wing armament is MG 17 in the inboard position and the MG/FF in the outboard position. The cowl guns are also MG 17 (these are rifle caliper guns, 7.98mm). The spinner is the shape it will be for the rest of the Fw 190 series. The cowling air intake bulge is now a lop-sided teardrop, the shape it will have for the rest of the variants. The panel area behind the exhaust is solid, no slots (although some were later retrofitted with slots). The pilot armor changes from the A-0. This variant was the first one to see widespread service. The panel behind the exhaust was fitted with open slots to help the cooling problems. The engine fitted was the BMW 801C-2. Externally there was no visible difference. The inboard wing armament position was now fitted with the MG 151 20mm cannon. A small round blister appeared on the cowling gun cover. This variant, while visually indistinguishable from the A-2, became the first one to have many sub-variants. The major change was the engine to a BMW 801D-1. This was the first engine that apparently gave few problems and a power increase. There were fighter bomber variants and since it was fitted with the ETC rack it could also carry the 300 liter drop tank. When the aircraft is fitted with the ETC rack, the inner landing gear door covers are not used, and there is a small fillet in each wheel well, making the inner shape round, not squarish. Also there were some produced without the outboard MG/FF cannons. A very small batch was fitted with special open cowling bulge intakes and MW 50 in an effort to get more high altitude performance. This is not the same intake as the tropical intake. It was apparently unsuccessful as no large production was done. The radio was changed and the tailfin mast was made vertical and an antenna lead went into the rear fuselage, ala the Bf 109. Some models were fitted with an early version of the FuG 16ZY "Morane" mast under the fuselage. The late production models had the cowling slots changed from open to closable with the rectangular shape like the A-5. Again there were many variants with camera, bomb rack and wing racks. These latter, for drop tanks became the precursor to the G-1. The F-1 was actually an armored version of a A-4 with bomb racks, but built as a "Schlachtflugzeug". Only a few of these were built. The majority of A-4 fighter-bombers seen in photos are A-4s fitted with racks, not F-1s. Frank Crenshaw's 1/48 Focke-Wulf Fw 190A-4 displays the characteristics of this early variant. Note the flat cowl cover for the MG 17 machine guns, the lack of a bulge over the outboard, wing mounted MG/FF cannon and the MG 151 as the inboard armament. Although it is difficult to pick up here, the cooling "gills" in the side of the engine cowl are the earlier, open slot type. In an effort to overcome both weight distribution problems and the eternal engine-heat problem, the entire engine was moved forward 5+ inches. This results in a longer cowling for the MG cover, fuselage side panel, and a special insert near the wing roots. The pilot armor changes again! The fuselage opening cover on the left side changes from a trapezoid shape to a larger, rectangular shape. A small batch with the same open cowling intakes. Again, not built beyond experimenting with a few. Grafs famous, gaudy A-5 was one of these. A-5/U3 which was the precursor to the F-2, but bombs only on the fuselage carrier. Several nightfighter variants including one fitted with Neptune. A-5/U8 which was the precursor to the G-2 and could be fitted with tanks on the outer wing positions. Several experiments with extra armament or torpedoes. The only one that became operational was the U12 with the 2 X MG 151 cannon in tubs under the wings. These served with JG 11 and perhaps JG 1. The U17 which, for the first time had wing stations for bombs. Some of these were used operationally, but the A-6 version of this aircraft became the F-3. The increasing loads the Fw was called on to bear resulted in a redesigned wing structure. Only the riveting pattern changed. For modeling purposes, unless you do 1/24, this is a non-issue. The outboard armament was now changed to the MG 151 20mm cannon. Now all the wing guns performed at the same rate of fire and velocity. Again there was a variant with the 20mm gun tubs and it may have served on a limited basis. There was a special variant that served as a "Sturmjager" with Jagdstaffel Kornatski. It was fitted with external fuselage and canopy armor and used for the head-on attacks against USAAF bombers. There was an equivalent F and G model as the F-3 and the G-3, but no designated A-6s served as ground attack variants. This was the first aircraft fitted with the MG 131, 13mm heavy machine guns in the cowling replacing the rifle caliper MG 17. This resulted in the typical bulges now seen on succeeding models. The fuselage carrier, however, did not move forward so the A-7s are easily distinguishable in a photo if they are carrying a drop tank. There was a special version, the A-7/R2 that carried the 30mm Mk 108 cannon in the outer wing positions. Many of these aircraft served with JG 11, Sturmgruppe Kornatski which became IV. (Sturm) JG 3 in June 1944, and JG 300. Many were also fitted with the special exterior armor, but there was no model differentiator for these. The larger breech of the Mk 108 cannon resulted in a rectangular bulge on top of the wing near the flap line. The F-7 and G-7 versions were never done as will be explained below. The ETC carrier was moved forward 8 inches to again help with weight distribution. The weight distribution problem was aggravated by the installation of the MW 50 tank in the fuselage behind the pilot. MW50 was to generate extra power below the rated altitude of the aircraft. This resulted in a squarish, with round corners, panel in the fuselage bottom where the tank was installed and removed. This is not on any earlier variant of Fw. Another panel was installed on the right fuselage side and the filler for the MW 50 tank was installed. Again, these are not on any earlier variant. So when youre converting backwards from an A-8 kit, to an A-7, A-6, or A-5 these have to be removed. Also, there were variants that looked like F-8 and G-8s but were not. These "F" versions did not have wing carriers for bombs. The "G" version was not fitted with special internal tanks and navigation equipment. There was also a variant for nightfighting fitted with "staghorn" aerials. To simplify production, the bulge for the Mk 108 cannon breech was placed on all aircraft, including the F-8. It did not affect performance and made for a more "universal" wing as far as production went. 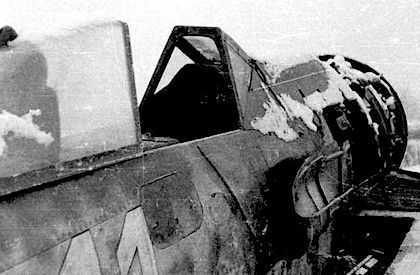 Additional, external armour applied to the fuselage sides of the "Sturmbock" versions can be clearly seen in this photo of a Fw 190A-8. The BMW 801TS engine was fitted. This was a substantial increase in power. It had a 14-blade engine fan instead of the 12-blades of the D versions. Statements about the TH engine being fitted on a wide basis are incorrect. The TS was a lesser version of the TH which never worked out of its development problems. A propeller with wider blades. This is quite distinct in photos. An enlarged (so-called "blown") canopy and different armor were fitted. Some of these were retrofitted to A-8s, but not on a widespread basis. The F series was a dedicated ground attack aircraft. These were fitted with armor around the cockpit sides, under the fuselage and the engine cowling. This armor, however, was in the form of thicker skinning. It was NOT the external appliqué armor fitted to the A-6/7/8. The F series did not carry the outer wing cannon, but did carry the cowling guns. Remember, these aircraft were fitted with armor that made them true F- series machines, but this was not externally visible. All carried a small, rectangular panel in the cockpit below the main instrument panel. This panel contained the bomb arming switches and status lights. As previously mentioned, this was based on the A-4/U3. Supposedly less than thirty were made. Ive never seen a verified photo of one. Im not even sure what the WNr block might have been. They had the centerline ETC rack, but no wing racks. This was based on the A-5/U3. It is difficult to distinguish, visually, from an A-5/U3. WNr. are the only reliable way. It had the centerline rack and bomb carrier, but no wing racks. This was based on the A5/U17 variant which had wing racks. However, the decision was made to mate this with the new wing design of the A-6. The result was the F-3. Some A-5/U17s may have served operationally, but these cannot be distinguished from a genuine F-3 except by WNr. It had the centerline rack which could carry bombs or a fuel tank. It had wing racks which carried small bombs. You frequently see F-3 aircraft without a full bomb-load. This was usually dictated by operational requirements. I.e., small, HE or frag bombs on the wings, but no centerline bomb, or vice-versa. It is extremely rare to see and F-3 or F-8 carrying bombs on all carriers. There was no F-4 through F-7, although experiments went on with each variant based on the A series. This was the variant used by so many SKG and SG Geschwadern in the last year of the war. It was based on the A-8 so it had the same panel lines. As per the F-3 it had wing and fuselage racks. Late in 1944 and into 1945, some began to carry the Pb 8 and other types of air to ground rockets. Remember, these also had the Mk 108 bulges in the top wing, but flat panels underneath the wing over the ammunition loading locations. Some were retrofitted with the bulged canopy and accompanying armor. This was not a "standard" fitting on the F-8. Chris Wauchop's Tamiya Fw 190F-8 illustrates the fuselage and outer wing racks, and the absence of bulge under the wings for the MK 108. This aircraft has also been fitted with the non-standard "blown" hood and associated armour. They did exist, but photos are rare and not totally verifiable. This was the parallel version of the A-9 but fitted with the F equipment of bomb racks, etc. The remaining F variants will not be covered because they were not used operationally. If you want to model one of these experimental variants, I suggest you buy the references listed and find a copy of the Monogram Close-Up on the F series. This series was the long-range fighter bomber. As such it was fitted with "wet" point wings, i.e. they had fuel lines and systems so drop tanks could be carried on the outer wings. Quite often, in operational situations, you will not see these wing racks, but only the centerline ETC rack carrying a bomb. This was because the long-range capability was frequently not needed, so the equipment was removed to save weight and drag. This is especially true when looking at photos of aircraft that flew with SKG 10 and StG 2, and SG 4 in Tunisia, Sicily and Italy. They look like F aircraft. However, the telltale identifier is that no G aircraft had upper cowling guns and the gun troughs were eliminated: i.e., the panel was flat. There is some doubt if this model was actually produced. It may well be that it was a "retro" designation of the A-4/U8. The A-4/U8 was fitted with the wing tanks and the faired in slipper covering the carrier. The most famous of these is the one captured by the RAF that mistakenly landed on a British airfield! It has flat black paint overspray. This was the equivalent of the A-5 version. It carried the so-called Messerschmitt-trager (carrier) which was the thin strut carrier. These were often fitted with exhaust pipe diffusers. These aircraft served in Normandy with SKG 20. This was the A-6 with the new wing. Again it could be fitted with the exhaust diffusers. There is some controversy about this aircraft. It was the equivalent of the A-8 and production did start, but is not clear how many were produced. What is clear is that to simplify production, the G-8 was cancelled and the A-8 was fitted with the "wet wing" equipment, center rack, etc. By this late stage of the war, the extra long range afforded by two wing tanks was not an operational requirement so it is rare to see them fitted. In photos this G-8 lookalike can be distinguished because the gun troughs for the MG 131s were still present. One or two photos have been identified as genuine G-8 aircraft. The above is intended as a general guide. I again strongly urge modelers of the Focke-Wulf 190 to buy the two books mentioned above. If there are questions, email me via the link below. Article Text Copyright © 1998 by John R. Beaman, Jr.